What a week! Today is my last day at work before the arrival of Baby Miller, which is a very very odd feeling. I've either worked or been in school since college, so to have four months ahead of me without heading into an office every day is going to be a little surreal for awhile. However, I am sure that taking care of the baby will be a much harder job than anything I've ever done (and definitely more rewarding, too). 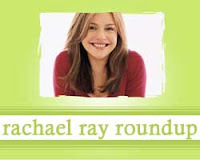 So, while we're waiting for her arrival, we might as well check out some Rachael Ray posts from around the blogosphere, right? Before we do, I have to let you know that Dunkin' Donuts is offering a free donut with the purchase of a cup of coffee on April 15th to make your tax day a little better. So go get some free stuff! If you see a post that you think would be good for the Roundup, or you write one yourself, e-mail me so I can be sure to include it. Amanda of Down Home Dining adapted a recipe for Shepherd's Pie from Every Day with Rachael Ray. Vicarious Foodie adapted Rachael's recipe for Spaghetti alla Ceci from Rachael's Food Network show, 30 Minute Meals. Elle's New England Kitchen discusses a love affair with chickpeas and Rachael's recipe for Tuna Orzo Salad. The Blooming Chef tried No Bake Chewy Granola Bars from Every Day with Rachael Ray and had good results even though they were a bit different than expected. Just Jared asks what you think of the low cut look Rachael Ray wore to a recent food bank fundraiser. Tracey Thompson at Food Obsessed discusses a recent segment on Rachael Ray's talk show about going green. Speaking of going green, Ecorazzi informs us that Rachael Ray is designing the menu for an event that is part of NYC's Go Green Expo. Ashley of The Spicy Skillet gave Rachael's recipe for Shrimp and Chorizo Quesadillas with Smoky Guacamole a try. Mondeep at Busy Family Kitchen pleased her whole family with Rachael's recipe for Ground Gyros Platter Deluxe. Check in with the winner of the first So You Think You Can Cook contest after her week at the Culinary Institute of America.